I won one of the giveaways from the Kona 30 Quilts for 30 Years blog hop! I won the Jaybird Quilts giveaway (which I really wanted to win): Kona Sunset Charm Square pack, Mini Lotus pattern from Jaybird Quilts, and a mini Hex N More ruler from Jaybird Quilts. 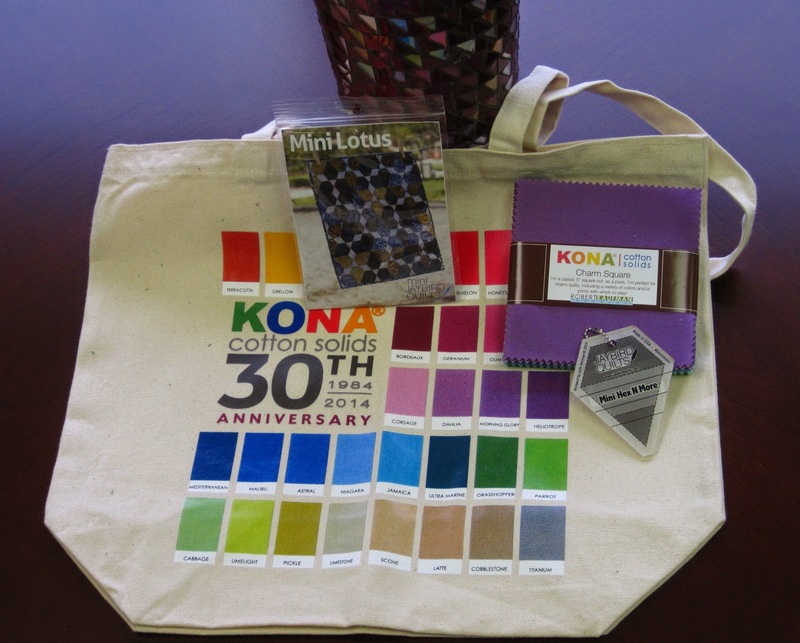 And if that wasn't enough to make me extremely happy, they included a Kona 30th anniversary tote bag. Have to decide what to make with the charm squares...and it will be for me. 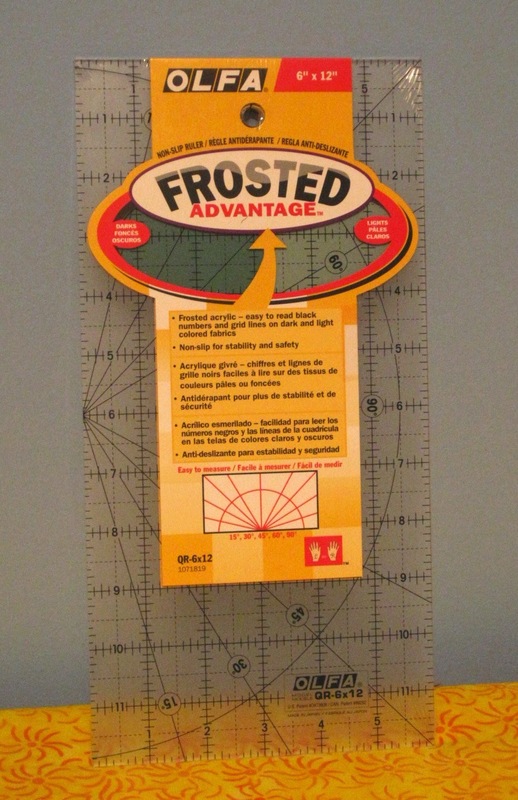 I have been coveting QD's clear OLFA 6 x 12 ruler for some time. If it ever goes missing, I know I will be suspect number one. Thank you Michaels 50% off coupon -- new ruler added to the collection. 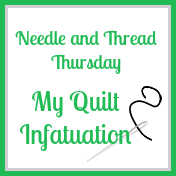 Well time to get into the sewing room to pack up some projects to work on tomorrow at the Maritime Modern Quilt Guild's Sew In. I love having a day dedicated just to quilting. It's a time to be productive, to be social, and to have a laugh. I get a whole lot more done that if I sewed at home by myself. 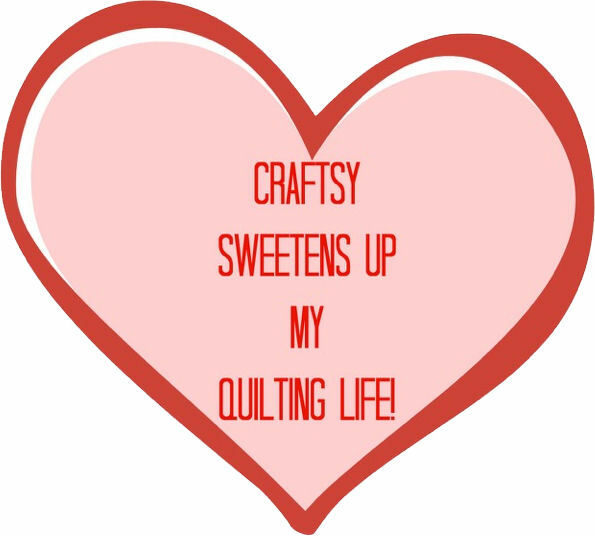 Here's to lots of quilty fun in all our weekend plans. 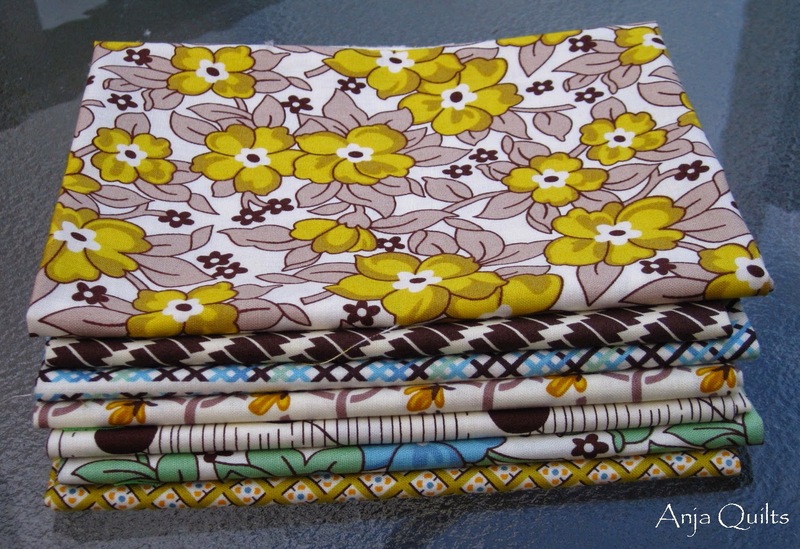 Sunday Stash - This Fabric Makes Me Happy! This past Tuesday, I was having an extremely bad day. 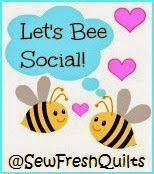 I came home and found my Sew Sisters Bargain Lovers' Club fat quarter collection in the mailbox. Bad mood averted. This fabric makes me happy! It is a combination of Stonehenge Kids Rainbow and Monster Truck Madness from Northcott. 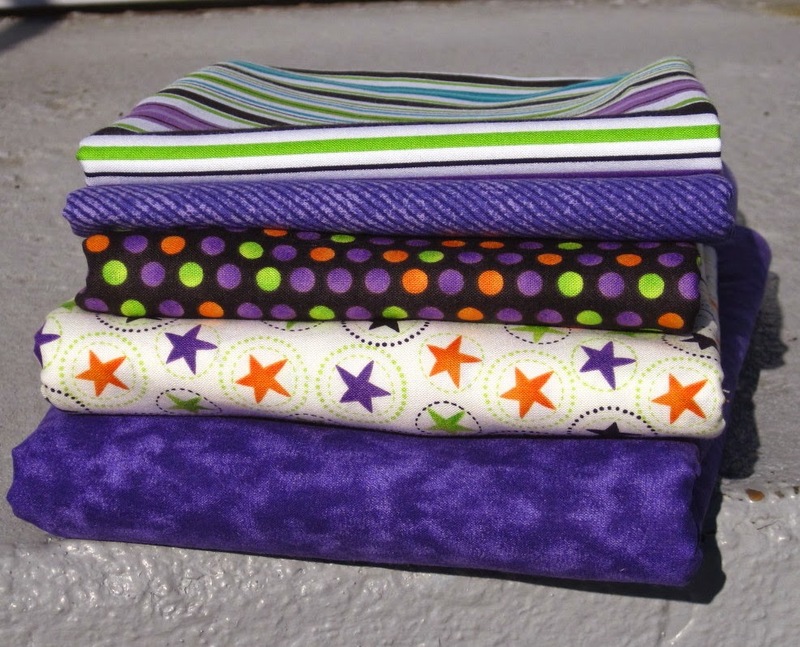 What awesome zippered pouches this fabric is going to make. Not a lot of sewing going on this week. I was busy doing paperwork to wrap up some volunteer positions that have ended, but I made these small storage bins. 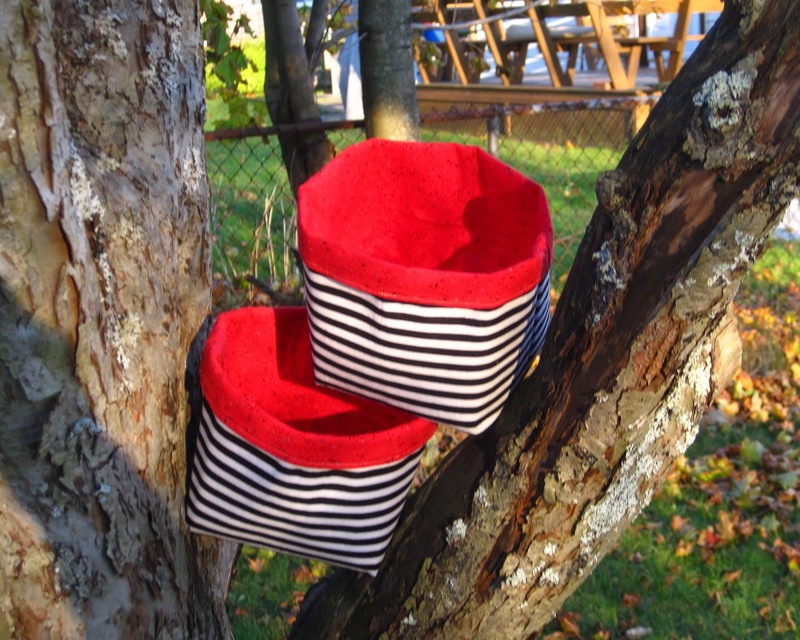 The pattern is from Haberdashery Fun and is quick and easy. 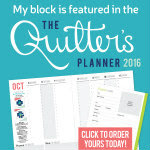 Now with only one small volunteer position, more time for quilting! Guess I can't procrastinate any longer on the tasks of organizing my fabric and my sewing room. 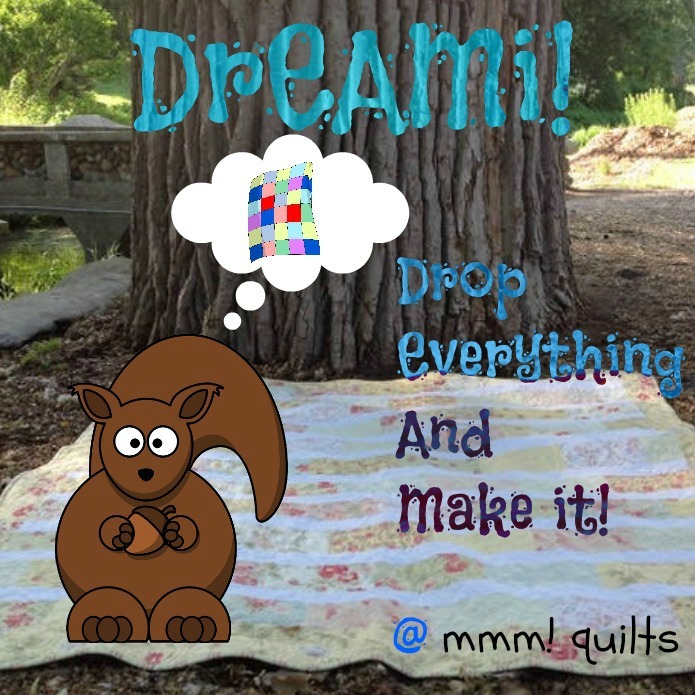 Linking up with Molli Sparkles for Sunday Stash. It's Atlantic Canada Day on Blogathon Canada! 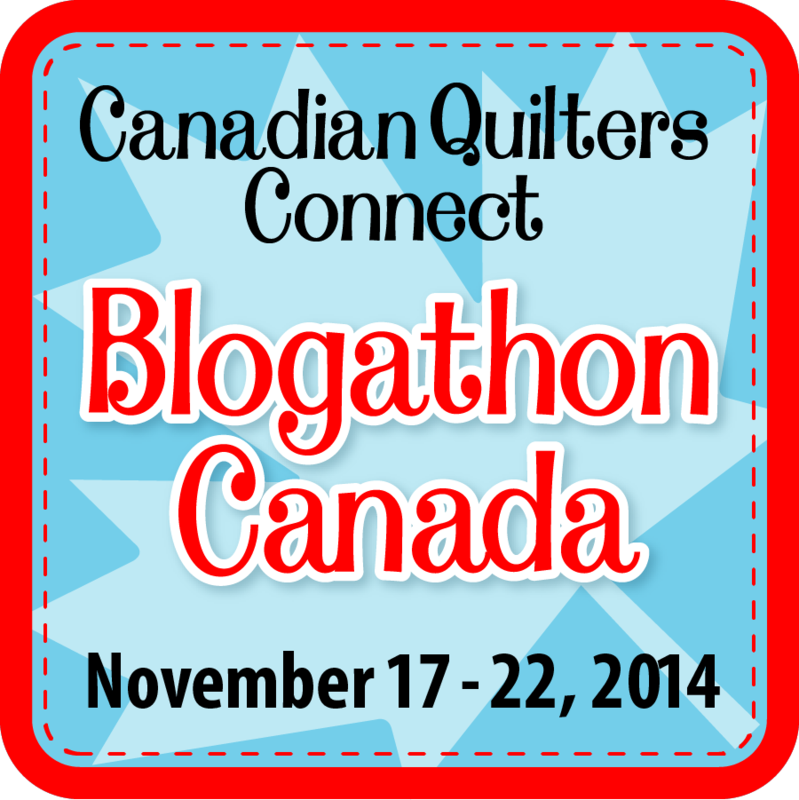 Sew Sisters Quilt Shop is once again hosting Blogathon Canada, which showcases bloggers across Canada. 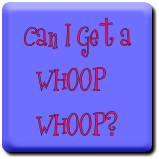 My friend Linda over at Scrapmaster is one of today's featured bloggers. I encourage you to check out what Linda has been up to and to visit other bloggers across the country. So a little bit about myself. 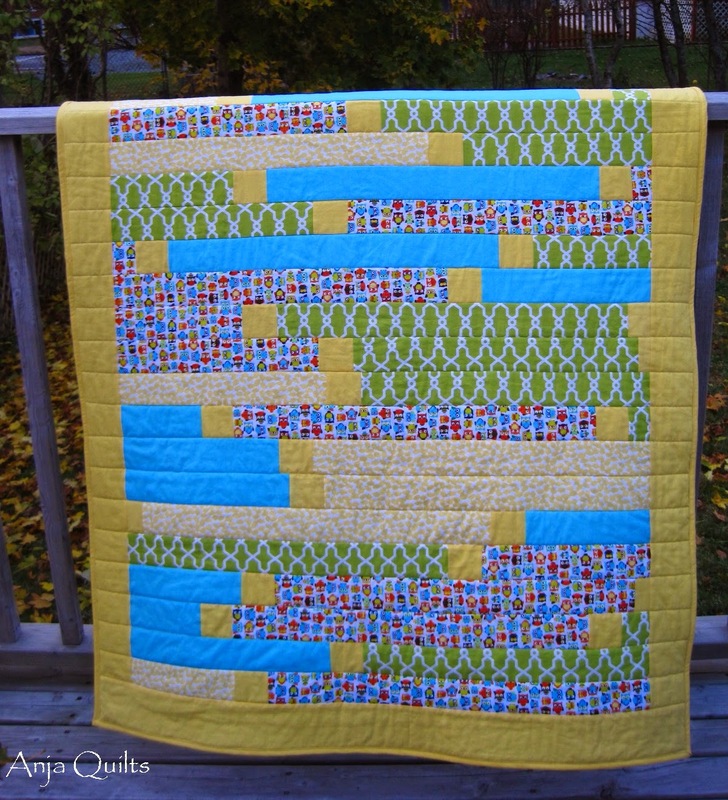 I started quilting in 2003 when I took a class at my LQS to make a quilt for my nephew. It was a flannel rail fence. And it was tied, not quilted. A project never to be repeated. 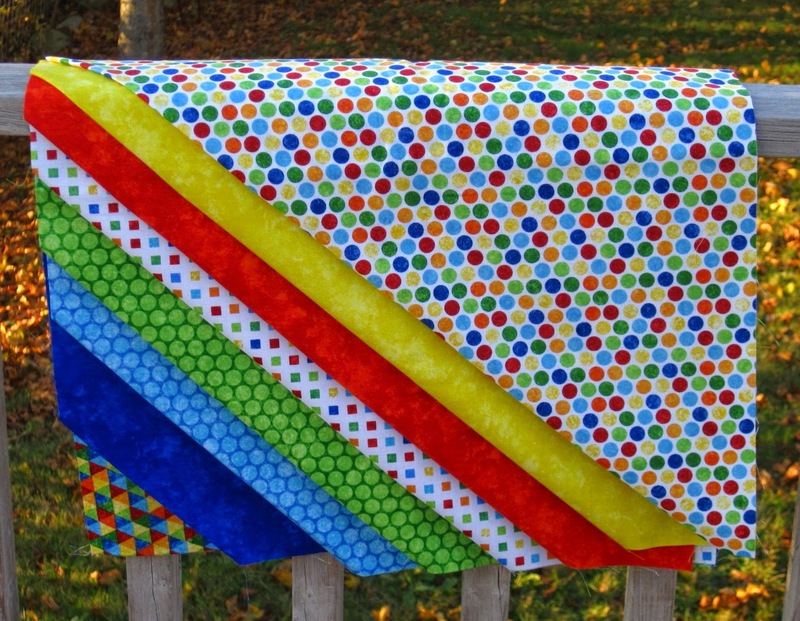 Sadly, that quilt has gone on to quilt heaven. 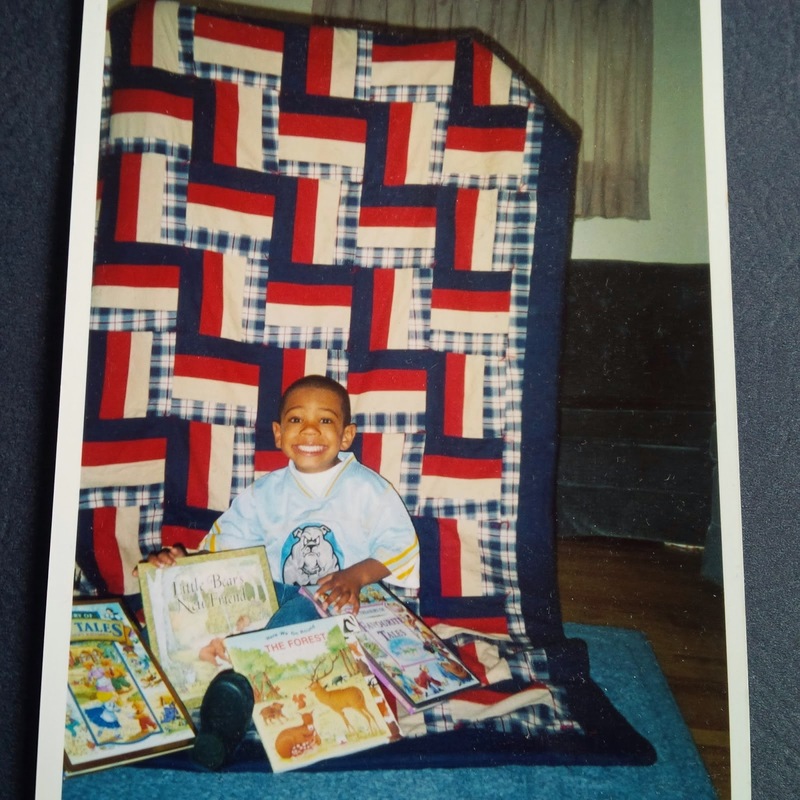 But don't worry, nephew has received many, many quilts over the years to make up for it. Adrienne over at Chezzetcook Modern Quilts started The Library Project at the beginning of the year. I wanted to win a prize, so I started my blog so I could participate. You can read about my project choices here. 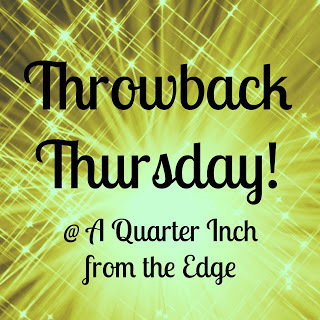 Who knew I'd have so much fun with the blog and that I would meet so many nice people. Bloggers are so friendly and are always willing to provide advice and information. I now have some new ideas for my blog. I finished my fourth and final Library Project back in October. So what to do? I still wanted to participate (and to win a prize, of course) so I added another project to my list. Jenn over A Quarter Inch From the Edge has been into English Paper Piecing hexies. 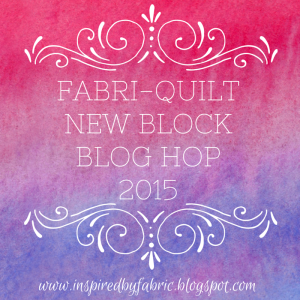 I am not a fan of hand quilting, but Jenn raves about EPP, so I thought I'd give it a try. 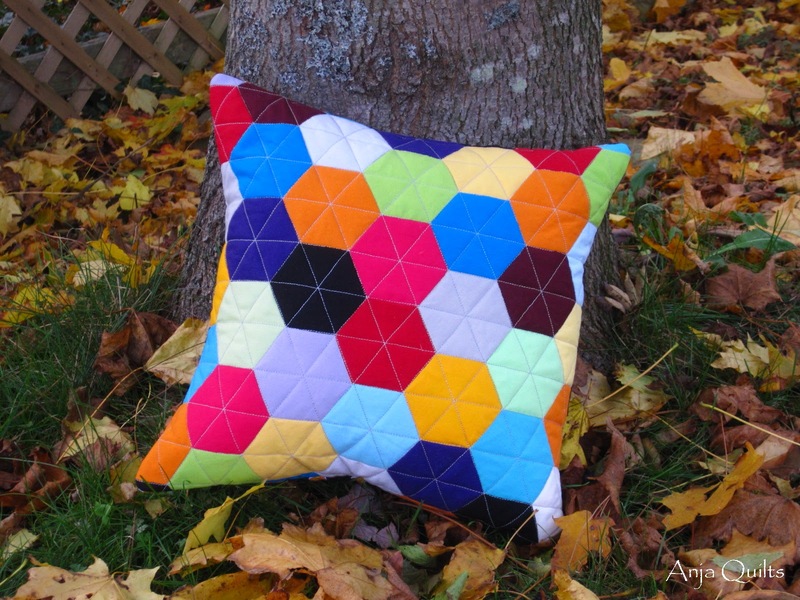 Here is my finished pillow. 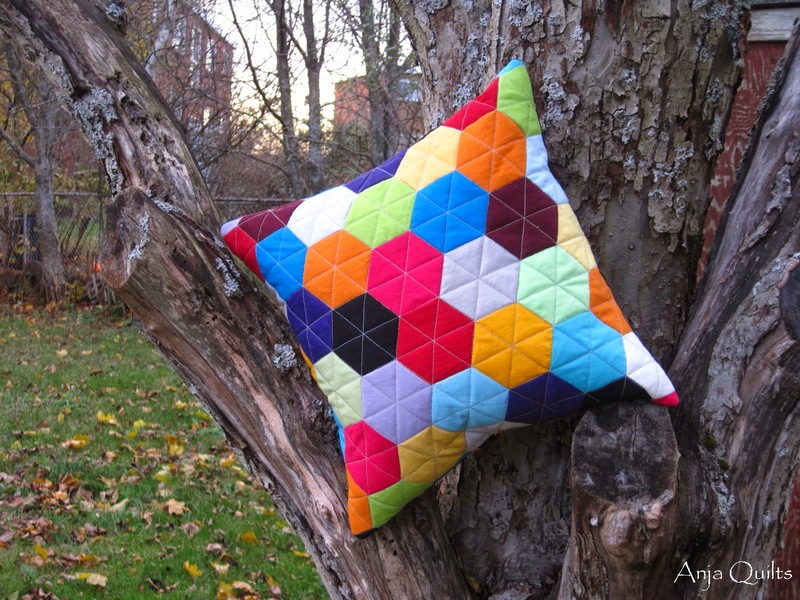 It's a small pillow at 14 inches, but I'm happy with my first adventure with EPP. I hope you enjoy visiting Atlantic Canada today. Whatever you are working on this week, I hope you are having fun. Thanks for stopping by to visit with me. 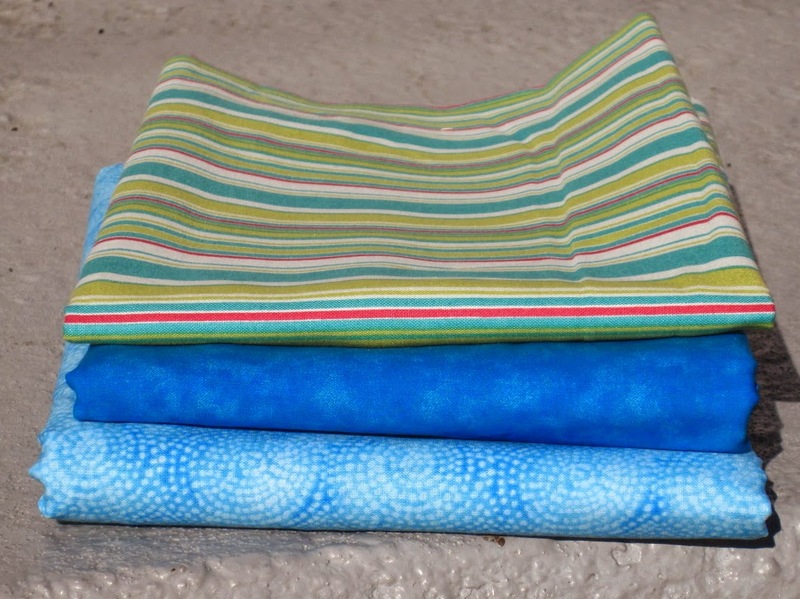 Sunday Stash - Free Fabric! 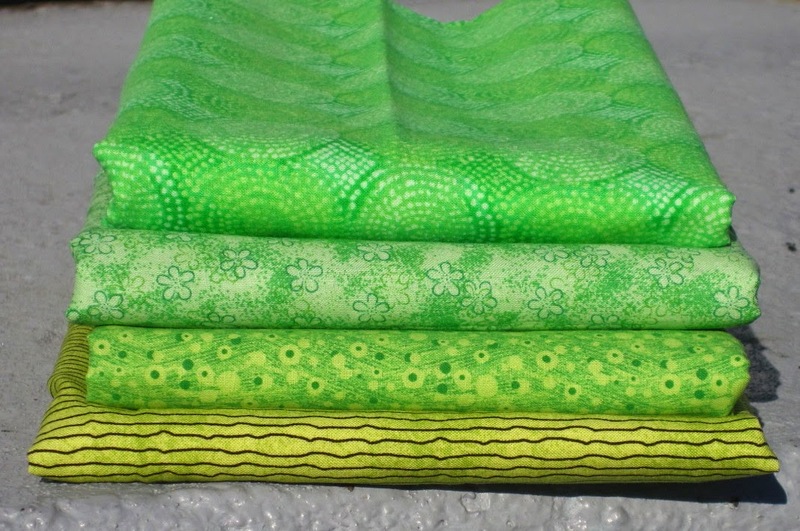 Each month, Sew Sisters Quilt Shop has a Kona Club Challenge. 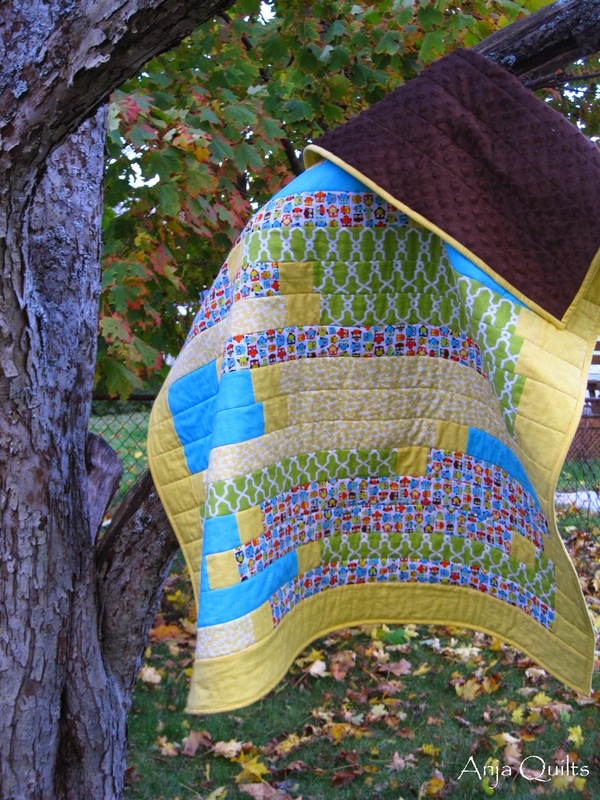 Bloggers create a tutorial for a project using the previous month's Kona Club fabric. I won October's giveaway!!! I enter so many online contests and never win. My prize arrived this week. I'm not sure what to make, but I think it's time to step out of my comfort zone and try something new. And then as if that weren't enough, I won a door prize at Maritime Modern Quilt Guild's one-year anniversary meeting Thursday night. Thanks to Patch Halifax for the donation. Patch graciously hosts the MMQG monthly meetings. 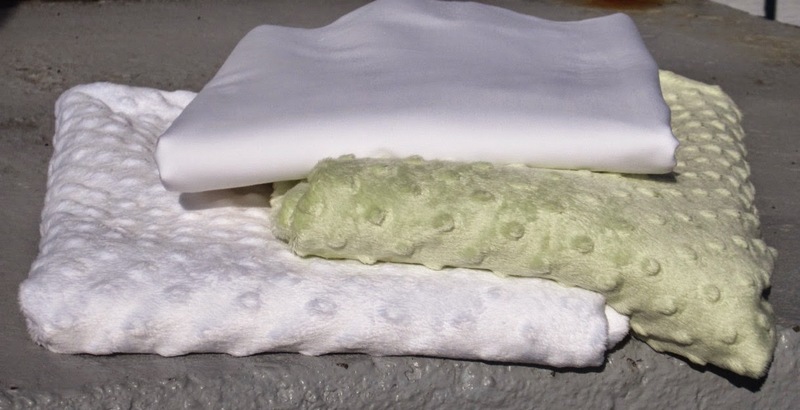 What to do with this delicious fabric? 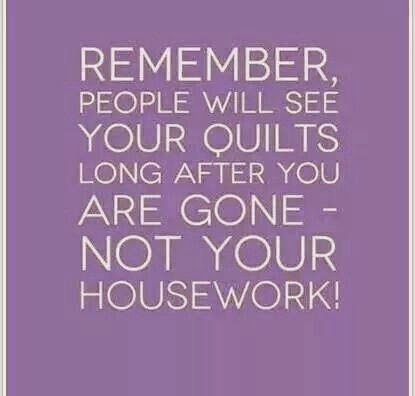 Since I spent all day yesterday and this afternoon sewing, it's time to get some housework done. It can only be avoided for so long. I have a list of things that need to be done around the house this weekend, but I ignored the list and decided to quilt today instead. And I'm so glad I did!! 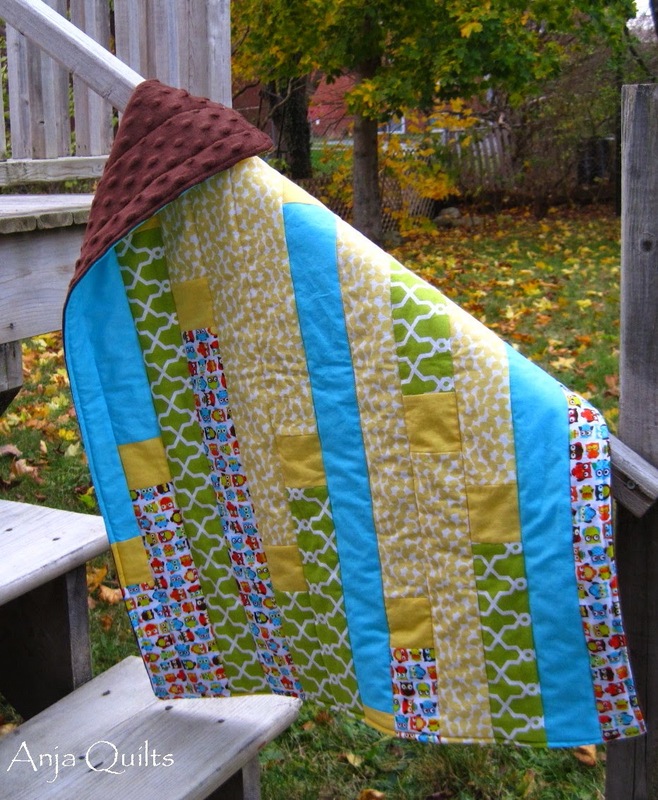 Here is a commissioned baby quilt that is finished two weeks early. I managed to get some photos before it got dark. And there are snow flurries out there. I am not ready for winter. 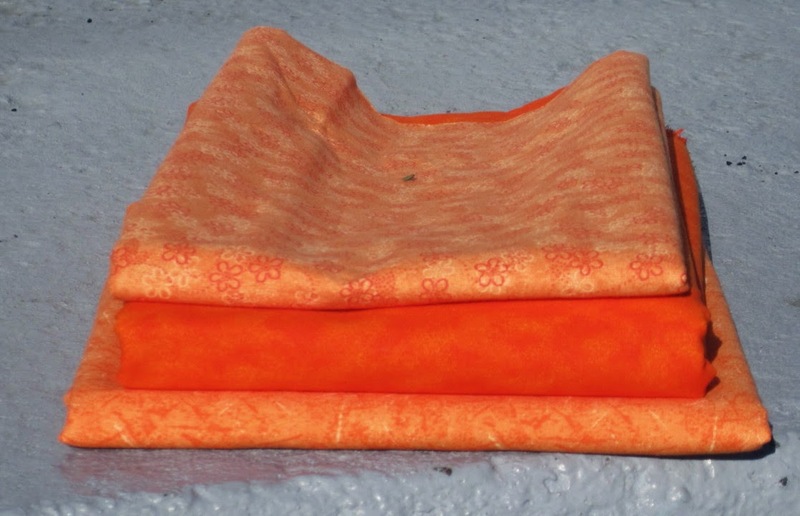 An over calculation of needed fabric resulted in a bonus small quilt that can be used for the car seat and/or stroller. 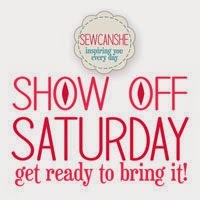 I'm "showing off" with Sew Can She for Show Off Saturday. 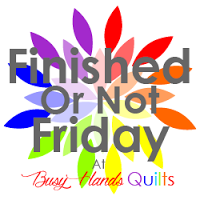 If I get takeout for supper, then I don't have to cook or clean up, leaving more time to do more quilting...hmmm...what are you avoiding this weekend so you can quilt? Arrived back last night from my annual shopping expedition to the United States. Bangor, Freeport, Portland, Kittery, and Portsmouth -- a lot of driving and shopping in three jam-packed days. Good thing day four is for driving home. This year, we added a trip to the Merrimack Premium Outlets. Well worth the extra hour of driving. But I sure was tired when I finally pulled into the driveway last night. I was too tired to even unpack and play with my new fabric. I bought five pairs of shoes, clothes, fabric, and quilting supplies. But imagine my surprise and horror to find that Kona cotton costs $8.99 a yard. Really??? I'll never complain about the $7.97 a metre we pay here in Canada. My goal was to purchase an entire bolt of Kona White. But I was not paying $8.99 at Joanns, and Hobby Lobby only had four metres. I used my 40% off coupon to get those four yards. Guess I'm still on a mission to get a bolt of White. Today's photos come to you courtesy of my front step. 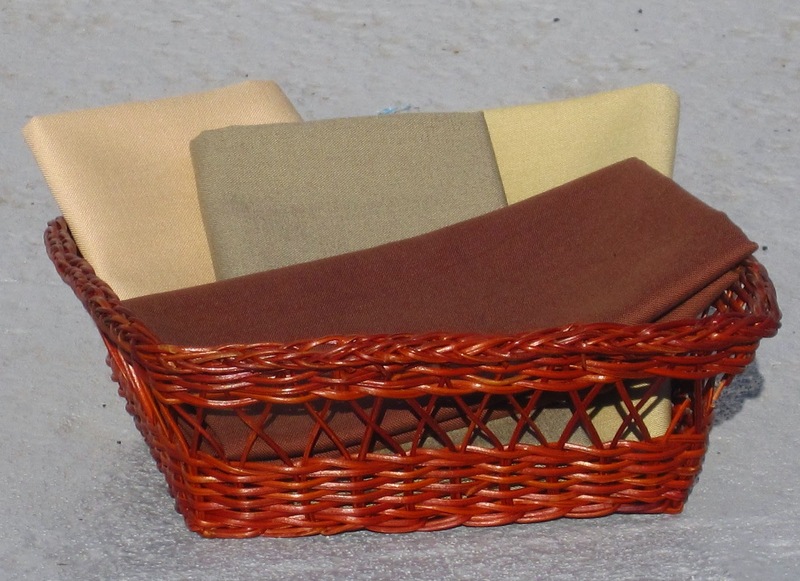 Today was a beautiful sunny day, around 12 degrees -- the fabric definitely needed to be outside. Quite a change from the chilly temperatures in the US. I purchased fabric at several different stores, but didn't realize until I got home that I purchased basically only four colours. Clearly, my mind was on these colours. 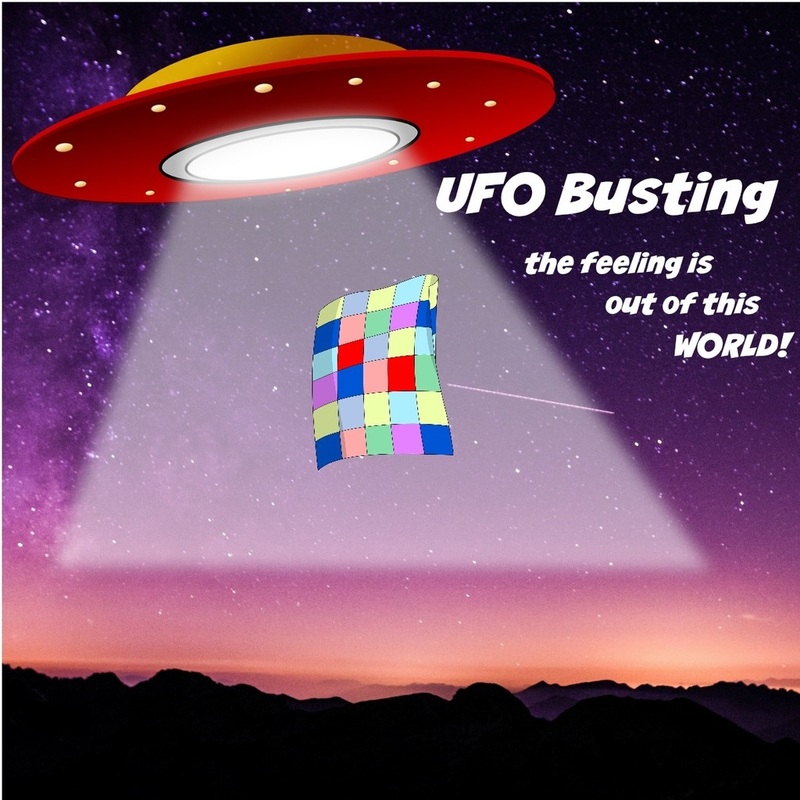 I had to stop buying fabric as I was running out of money and reaching the $800 Customs limit. Why does the tax man have to ruin all my fun???? I also bought three cans of basting spray and a new Olfa cutter and blades. QJ and QB both have an Olfa cutter and rave about it. Since they were on sale for $10, I thought I deserved a treat...as if all the fabric wasn't treat enough. Now comes the chore of washing, drying, and ironing. But that gets me closer to playing with it. I'm home just 24 hours, and I'm already thinking ahead to next year's trip. Perhaps two trips are in order...time to start saving my pennies nickels.